Believe it or not, even pet parents who are on the slightly obsessive side about cleanliness don't always consider the condition of their dog's or cat's food and water bowls. Many pets are fed away from the kitchen, and so their bowls aren't sitting in the middle of the kitchen floor as a reminder. Other pets are fed kibble (which I don't recommend unless you can't afford anything else) and their humans mistakenly believe the empty bowl is more or less clean. Water bowls, filled or empty, also get surprisingly funky and need regular washing. How Often Should You Wash Your Pet's Food Bowl? The experts recommend washing food bowls after every meal, and regardless of what type of diet you offer your pet. Food bowls should be washed with hot, soapy water after each meal, and water bowls should be wiped dry before refilling, and thoroughly washed every couple of days or more often as necessary. Some of these bacteria pose a potential danger, especially to the very young, the elderly and people with compromised immune systems. It's very important to wash your hands with soap and water after handling your pet's food, and also their food bowls. Some pet parents tend to go overboard when they get around to cleaning their dog's or cat's food and water bowls, breaking out all kinds of caustic cleaning agents, including bleach. No chemicals are necessary (nor do I recommend them) if you carefully wash the bowls after each meal with hot, soapy water. As you're rinsing, run your hand around the bowl, inside and out, checking for any little food chunks you might've missed, and insuring there's no slimy feel to the bowl. If you feel a little chunk or some slime, keep scrubbing. An alternative to hand washing is to put the bowls in the dishwasher, but since most pets eat twice a day, you'll either need to run your dishwasher a lot, or you'll need a large supply of extra bowls. In my opinion, there's no need to wash your pet's bowls or serving utensils separately from human dishes, but many people do. Plastic food and water bowls are probably the most popular with pet parents, but I'm not a big fan. While plastic bowls are inexpensive and convenient, they're also impossible to thoroughly sanitize, and in addition, as the plastic begins to break down it can leach toxic chemicals into your pet's food and water. Bacteria and oils can also get trapped in the peeling plastic, potentially causing skin irritation or worse. Some dogs and cats can develop allergies to the dyes and materials in plastic bowls, and they've also been linked to tear staining. In addition, aggressive chewers have been known to gnaw their bowls into small pieces and swallow them. I recommend stainless steel, porcelain or glass food and water bowls for your pet. It's fine to use a plastic bowl when you're traveling with your furry family member or in other temporary situations, as long as you clean it thoroughly after each use and replace it at the first sign the plastic is degrading. The dog parents used each of these four combinations during each of four trials. As you might guess, the food portions offered to the dogs using the small bowl with the small scoop were significantly less than all other bowl and scoop combinations. The small/small combination averaged about 151 grams versus 172, 173 and 185 grams for the other combinations. The small bowl/large scoop and the large bowl/small scoop amounts were almost the same (172 grams versus 173 grams). Use of the large bowl with the large scoop resulted in 185-gram servings. These findings are consistent with findings in human trials. According to study authors, the results emphasize the need for pet owners to use standard measuring cups and for people with overweight pets to use smaller bowls and serving scoops. If the speed at which your dog (or cat) eats makes you nervous, or if she routinely chokes or vomits during or immediately after a meal because she ate too fast, or if you have a breed prone to bloat, here are five useful tips for slowing down her mealtime roll. 1. Use a puzzle feeder or treat-release toy. These products are designed to hide treats to help keep your pet mentally stimulated, but when used at mealtime, they offer the added bonus of making food gulping impossible. Even better — the toys are especially challenging when they're filled with species-appropriate (moist) food. 2. Serve your pet meals on a cookie sheet. Spread the food around the sheet, which will force him to do a lot of licking and much less gulping. 3. Use a muffin tin. Spoon a bit of your pet's food into each individual muffin cup. The need to move from cup to cup will put the brakes on gulping. 4. Consider purchasing a slow feeder bowl. There are many styles of bowls available, but I recommend stainless steel over plastic. The design of the stainless steel slow feeder bowl is simple — there's typically a single dome in the center, and the food is placed around it, making gulping impossible. There's also the Brake-Fast bowl, which has a slightly more complex design. 5. Create your own slow feeder bowl. Place a ball, large rock or other round object in the middle of your pet's bowl and distribute the food around it. 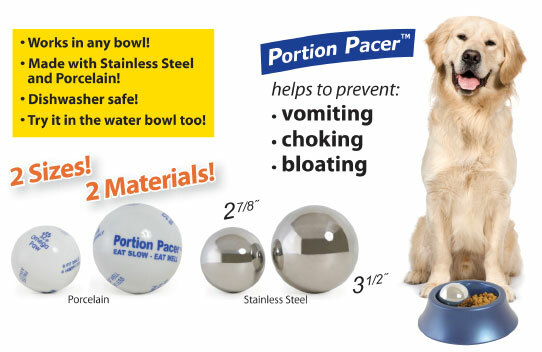 (The object should be big enough that your pet can't swallow it.) Alternatively, you can purchase a portion pacer made of stainless steel or porcelain.